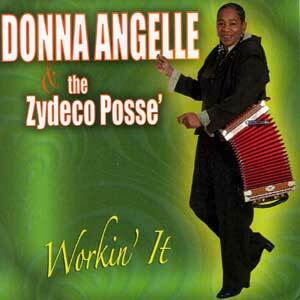 Donna Angelle & the Zydeco Posse’ – "Workin’ It"
Donna Angelle (born Donna Charles in 1951 in southwest Louisiana) has released her 5th CD. By the name of “Workin’ It”, Donna Angelle & the Zydeco Posse’ offered MTE Records some real good work. The CD starts out with a lot of rhythm and Zydeco enthusiasm in “Rodeo Show” and “Creole Woman”, two great self-written songs by Donna and washboard player Michelle Citizen (who are both responsible for most of the songs on this CD). Donna demonstrates her decent vocal capacity with Soul-ballad “I Rather Go Blind”. With her successful song “Old Man Sweetheart” (that already was included on different compilation discs), she pays tribute to Zydeco legend Boozoo Chavis. “Catin”, the only song in French here, is a fine waltz. Once the jitterbuggin’ “Rockin’ It Steady” runs out of its intro, it’s hard to stand still. On “Don’t Let The Green Grass Fool You” Donna plays some nice full sounding accordion riffs again. Title track “Workin’ It” is another of her typical up-tempo Zydeco two-steps. Boozoo’s “I Got A Paper In My Shoe” surely doesn’t need any introduction, but Donna sings the spicy version with “I Got A Pepper In My Shoe”… This 12-track CD, who surely is a must for everyone who care about good Zydeco music, ends with a rhythmic Christmas song “Zydeco Santa”. And of course not to forget is the great professional back-up from the musicians of Zydeco Posse’ and some additional guest musicians. With this CD, Donna surely has reserved her place within the big Zydeco-acts. Joseph Adam Mouton, a.k.a. 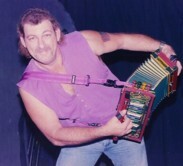 Zydeco Joe, and his Laissez Le Bon Temps Rouler Band has a brand new CD out on ZG Records. “Black Cat” includes 7 tracks and is good for 34 minutes of pure Zydeco-music. All tracks are self-penned by Zydeco Joe and have a typical danceable rhythm. Opener “Caroline Riding In The Buggy” will be a real Zydeco two-step dance hit. Title track “Black Cat” is about a cat that frequently came over to Zydeco Joe’s family porch, while they all were playing music. “Poppa Jack” is a story about Joe’s uncle. “They Tried To Steal My Chicken” is a bit in the same funny atmosphere as Boozoo Chavis’ “Dog Hill”. More typical Zydeco-humour in “You Can’t Rooster Like You Used To”. The music from Zydeco Joe and the Laissez Le Bon Temps Rouler Band (who will play at the Cajun & Zydeco-festival in Saulieu, France) is a must for all Zydeco-dancers! It's almost Saulieu-time again, so be prepared for the 13th Cajun & Zydeco Music, Film & Food Festival in Bourgogne, France from the 3rd till the 7th August. 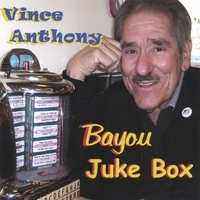 Vince Anthony, a well-known Swamp Pop artist since the sixties, is still a very active singer and performer. “Bayou Juke Box” is the name of his brand new CD on Midnight Gold. Covers include real good Swamp Pop versions of T. Graham Brown’s “I Tell It Like It Used To Be”, Larry Williams “The Hoochie Coo” and Sam The Sham’s “Wooly Bully”. And again, Vince himself wrote a big part of the tracks (12 out of 17). It’s all good stuff, but just to mention some of my personal highlights of his songs: “Is It Over” which has that lovely typical strolling Swamp Pop beat from South Louisiana, “Honey Chile” and “Lucy Lou” (both real soulful Swamp Pop), and “Zydeco, Fais Do-Do, Swamp Pop Music”, a rhythmic song with the most typical Swamp Pop ingredients (Rock’n’Roll rhythm, Country guitars and Soul-music accents) included. This CD is a good proof that good ol’ Swamp Pop music is still alive! 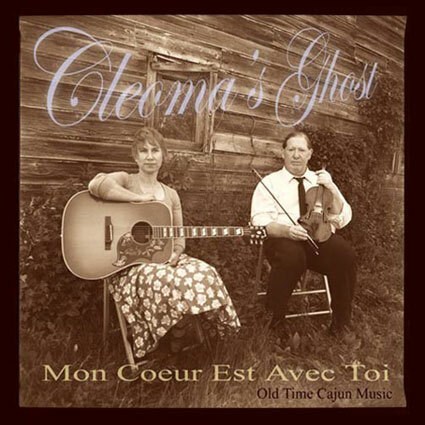 “Mon Coeur Est Avec Toi”, which is a real fine traditional Old-Time Cajun CD by the band Cleoma’s Ghost (see earlier review), is nominated by CFMA for the category “best Cajun recording by a band outside of Louisiana”. Cleoma’s Ghost is a 2-piece band (Roger Weiss on fiddle and vocals, Buffy Lewis on guitar and vocals), based in the state of New York. 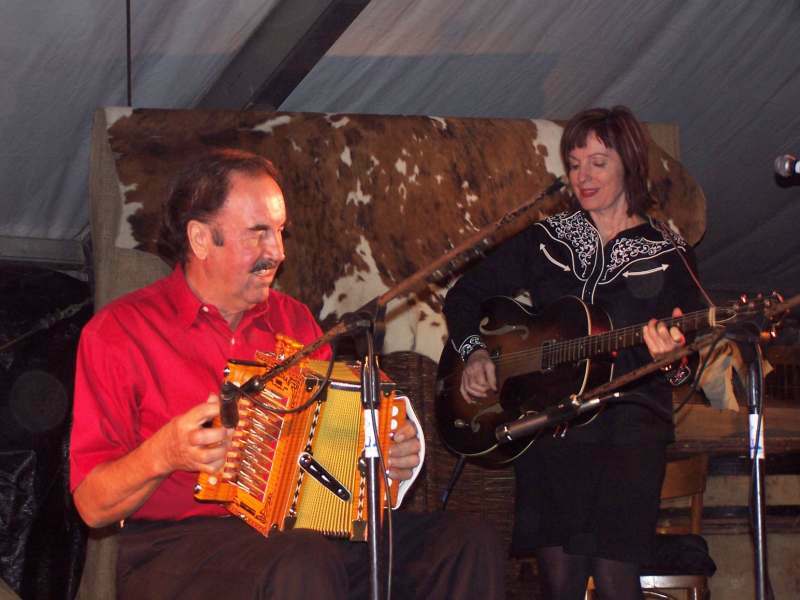 Organisers who are interested in this traditional Cajun duo can contact them by e-mail on their website (see link below). Roger and Buffy would be very glad to come to Europe…! 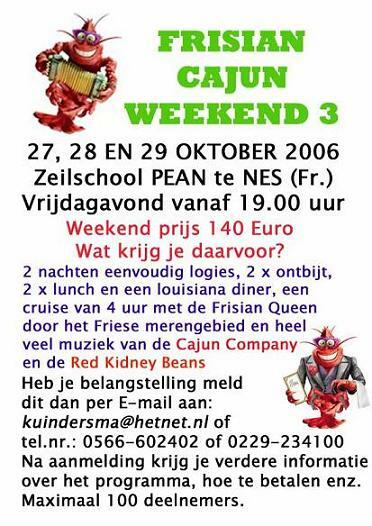 Here's the flyer for the 3rd Cajun & Zydeco weekend on 27th - 29th October 2006, in zeilschool (sailing club) Pean, Friesland (North of Holland). On Saturday 17th June the award-prices for the best European Cajun & Zydeco musicians, bands & cd’s, were given during the (Cajun &) Zydeco-festival at Raamsdonkveer, Holland. Check the link below for the results! Congratulations to the winners and all other musicians & fans who keep that great music alive! Great music and atmosphere, last weekend in a small town next to Virton in the Belgium Ardens. On Saturday night (the night before the festival) we enjoyed a jam session at the organiser’s home. When we heard live Cajun music coming out of the house, we occasionally passed by a few times… The owners were so friendly to let us in. So we could join a small private concert from the Savoy Family Cajun Band (Marc, Ann, Wilson and Joel) and some members of the Straps (which is a talented Belgian Old-Time Country band from that neighbourhood). Later when Marc and Ann Savoy were tired (jetlag), they went to sleep and Jan Schelpe (guitar) and I (Cajun accordion and vocals) joined the jam session with Wilson Savoy (fiddle, vocals, guitar, accordion), Joel Savoy (fiddle) and some Straps. This already was a great experience, so the weekend couldn’t go wrong anymore. The next day, it was festival-time. The place was filled with enthusiast people from the region and cowboys, roots- and Cajun-fans (and musicians) from Belgium and Holland. See more pictures on the link below, that brings you to the website of the Straps. The only bad thing we can say about this festival was the weather. The organisation, the bands, the crowd, the atmosphere, the drinks and the food (jambalaya and gumbo included) were great! Because the rain didn’t allow an “open air-festival”, all bands played inside. But the good food was a reason to take a shower outside. Big Bayou Bandits ( www.bigbayoubandits.com ) played an enthusiastic set of good ol’ Cajun (such as “Lafayette”, “Choupique Two-Step”, “Ouvre Cette Porte”, “One Step A Chaumant”, “J’suis Content D’être Un Cajun”…), Bayou Rockabilly (like “Back Home Again In Louisiana” and their own “Paddle On The Bayou”) and Bluegrass (“Foggy Mountain Breakdown” and “Miner’s Prayer”). A lot of variation for a 3-piece band! The Swamptones (www.swamptones.de ) from Germany played great Zydeco with all its ingredients like Swamp Pop, Rock’n’Roll and New Orleans Rhythm ‘n’ Blues. Their set, full of Louisiana Party music, includes songs like “Don’t Mess With My Toot Toot”, “Who Stole The Hot Sauce?”, “What You Gonna Do”, etc. Le Clou (www.leclou.com ) is a professional band including some French people living in Germany since many years. With their own style and sound they did a nice set of Canadian & Cajun folk-rock. Traditional sounding fiddle and accordion are backed by powerful drums, bass and rhythm guitar. Great atmosphere in the “ballroom” and also backstage with this sympathic musicians! This band from Finland was formed in 1995. Since 2000 the members of the band are Jarkko Helin (on accordion and vocals), Tommi Tenkula (on bass and vocals), Janne Salo (on drums) and Marko Aho (on guitar). Singer-accordionist Jarkko Helin, who is the only original member of the band, has toured several times in Europe as accordionist for Cajun Du Nord. He also build his own (Cajun styled) “Crawfish accordions”. 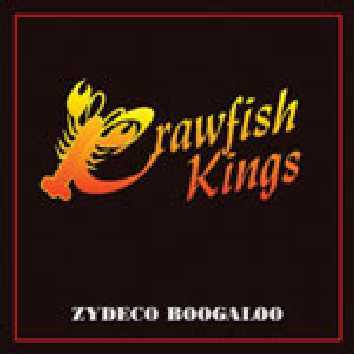 After “Guaranteed To Make You Dance” in 2001, “Zydeco Boogaloo” (November 2005) is their second CD. Opener is a rockin’ Zydeco version of Boozoo Chavis’ bluesy zydeco song “Paper In My Shoe”. The album continues with “Evangeline Special”, a great instrumental Cajun traditional. This is one of the songs where the accordionist (and of course also the other musicians) demonstrates his talent. New Orleans traditional “Iko Iko” has a funky dance sound. Flaco Jimenez already surprised me earlier with his Tex-Mex version of the Beatles’ “Love Me Do”. Well, the Crawfish Kings made their Zydeco version of this song. “Zydeco Boogaloo” is a frantic zydeco accordion-instrumental, here done with vocals. More famous zydeco tracks on this CD are “Give Me Just A Little Time”, “Zydeco Mardi Gras”, “Lula Lula Don’t You Go To Bingo” and “Zydeco Shoes”. D.L. Menard’s classic “Back Door” and Hank Williams’ “Jambalaya” are also present on this cd. Find out more of this talented rockin’ Zydeco band on their website.